Christians and the Arts – I Commend Joy! Here are the truths I am pursuing a deeper understanding of in order to establish a firm foundation for why and how I engage in the art of photography for the glory of God. I think they can also serve as a defense for any Christian’s artistic endeavors. Creation is a gift from God (and by creation, I mean all that God has made, not just mountains, birds, and trees). It is meant to display and communicate his glory. God hides himself in creation. Unbelievers seldom see him in it, but believers are given eyes to see, so they can glorify God through it. In order to glimpse of the glory of God in creation, we actually have to engage with it. All art has one source: God’s universe. We create nothing, but only imitate the creator. Cultural and artistic expressions are gifts from God which we should not neglect. Culture that glorifies God is a foretaste of what we will experience in the new heavens and new earth. Christians should avoid quickly judging cultural expression as sacred or secular. God also reveals himself through his common grace. Christian cultural expression should not solely focus on the beautiful and the romantic, but should include the flawed. The Gospel of Jesus Christ is the ultimate example of fusing heaven and earth, and serves as the ultimate source of inspiration for those engaged in artistic pursuits. His reasons I believe serve anyone who is involved in the arts. 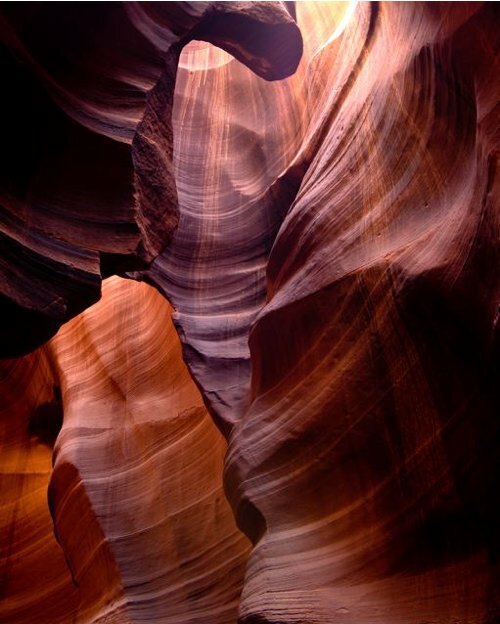 Below is just one of his amazing photographs that he includes in this series, a photo of Antelope Canyon in Page, Arizona.